Place velcro on the RIGHT side of the smaller piece 1.5 cm down from the top and equidistant from the raw side edgesPin the velcro in place by placing pins vertically to the horizontal piece of velcroSew around the velcro in a box shape. sewing as close to the edge of the velcro as you can but making sure you catch it all!Apply the velcro in the same way to the large square piece. Now the velcro is in place, take the two small rectangle shapes (one with and one without velcro) and place them with the right sides together. Pin and sew the top edges together (the 22cm line) by placing the fabrics right sides together with the velcro at the top. Sew one line 0.5cm seam allowance so you are not sewing over the velcro. Take 1 x large piece with the velcro on and pop it on the square without the velcro on with right sides together, pin down the side edges and sew the 3 SIDES ONLY with a small 0.5 seam allowance. Take the other large piece and lay it on top of the small rectangle with the velcro on. Sew the 3 sides up, up to the stitch line. Step 4 Sew up the top box – the final 3 sides remaining. Turn the whole piece through using the small gap and press it all nice and flat. Push the lining inside the outer fabric.Press, press press! Sew up the small hole inside! 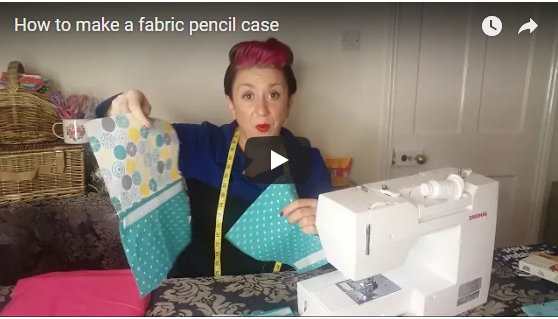 Previous post: What’s your BIG SEWING QUESTION? Next post: I’ve lost my sewjo, how do I get it back?